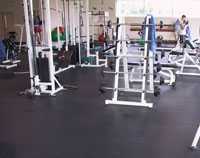 Buy Rubber Weight Room Flooring for Commercial or Home Use Gyms. Rubber Floors are Made in the USA. CWF Flooring, Inc. is a rubber flooring store located an hour north of Los Angeles, California. 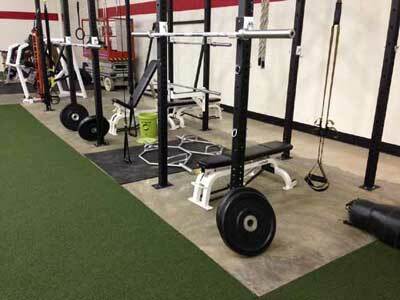 We produce rubber floors & mats for weight training, gyms, weight room flooring, commercial gyms and fitness centers. Our rubber floors provides excellent spike and dumbell resistance with anti-slip attributes. The 3/8" thickness is a durable solution for fitness centers, ice rinks and other high impact spaces. We also produce 1/4" thickness for residential applications, 3/8" for commercial gyms and 1/2" thickness for areas of extreme use. Our rubber flooring rolls, interlocking rubber tiles and square cut tiles are available in 11 different color options. Solid black rubber sport surfaces are the most economical. 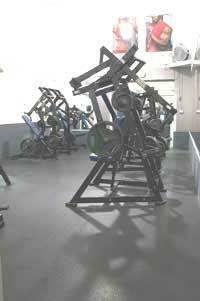 CWF Flooring, Inc. has a large stock of weight room flooring ready to ship! Manufactured with three thickness options and two densities our rubber flooring store, located north of Los Angeles, California. 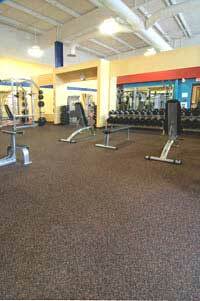 Buy weight room flooring, aerobics floors for commercial use and home use applications. Recommended thickness for commercial weight room floors and fitness centers is 3/8” or 1/2" thick. Rubber rolls are more economical and easier to install the rubber tiles. 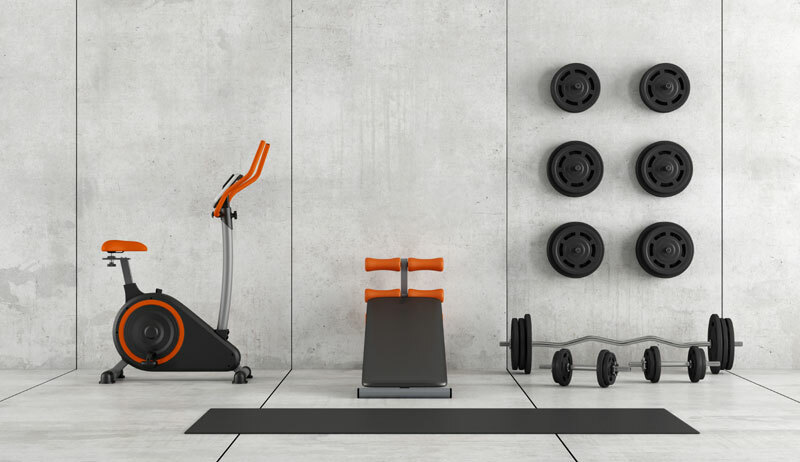 Home gym floors can use ¼” thick rubber with any excess rubber can be cut up into square pieces and placed under weight training and gym equipment. However, 3/8” is still recommended for all fitness applications. As well, 3/8” or 1/2" thick rubber will assist in sound abatement and slightly enhance anti-fatigue properties to your gym floor, especially commercial fitness centers. WARRANTY: CWF Flooring, Inc. guarantees our products for five years to the original purchaser from defective manufacturing under normal conditions and will, at its own discretion, replace the defective material goods or issue credit not to exceed the selling price of the defective goods. 48" Wide Rolled Rubber 1/4" thick. Rubber Rolls: Priced per square foot. 48" Wide Rolled Rubber 3/8" thick. 100% Solid Black Rubber $1.39 sq. 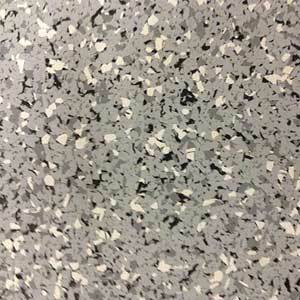 ft.
10% Color / 90% Black $1.79 sq. 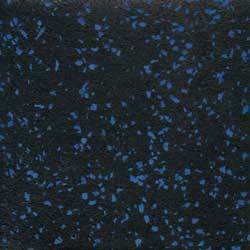 ft.
20% Color / 80% Black $2.06 sq. ft.
min order: 200 sq ft.
100% Solid Black Rubber $2.13 sq. ft.
10% Color / 90% Black $2.25 sq. 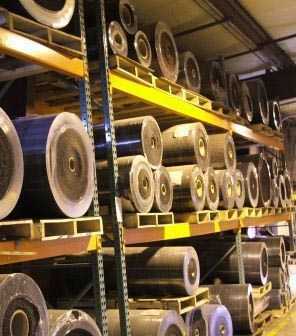 ft.
Rubber Flooring Rolls: Priced per square foot. 100% Solid Black Rubber $2.43 sq. 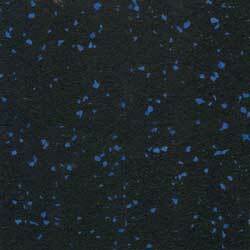 ft.
10% Color / 90% Black $2.73 sq. 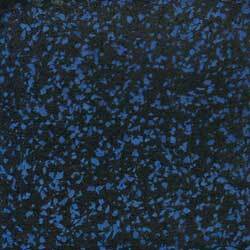 ft.
20% Color / 80% Black $3.11 sq. ft.
DESIGN & BUY YOUR OWN Rubber Flooring COLOR COMBINATIONS HERE! Order Your Designer Sample Swatch NOW! This floor is denser than our regular rubber because it's reground. In other words, it's an accumulation of excess stock of various colors that are re-ground, melted, formed, re-colored and cut. 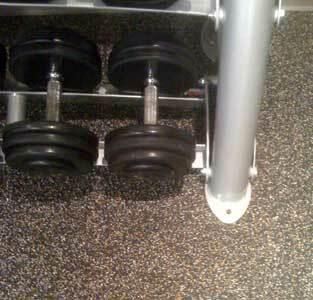 Regrind rubber floors are 90% black, denser and heavier than regular rubber gym flooring: 3/8” thick is 2.3 lbs. per sq ft. versus 2.5 lbs. per sq ft for the reground rubber sport floors. min order: 360 sq. ft.
Non- porous and firm, our dense rubber rolls and tiles will not absorb odor or moisture. Rubber flooring will minimize noise and vibrations, even on ceramic tile. There are several main factors that determine the quality of rubber weight room floor manufacturing. The key factor is the weight/density of the rubber. Our rubber is hydraulically compressed using prime rubber crumb. Prime; meaning without radio belt fibers or wires mixed with the rubber crumb. 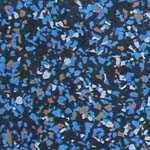 This high quality material makes it the choice for commercial gym flooring and economical enough for home gyms and commercial weight rooms. The pounds per square inch (PSI) of the hydraulic compression drums are set at 3000 PSI which will result in dense rubber with superior tensile strength. Consequently, you’ll receive, literally, more pounds for your buck. Rubber is a resilient floor, flexible and slightly malleable under extreme conditions. 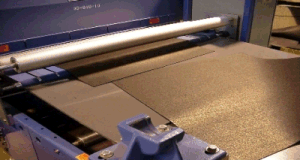 This allows a nominal width of 48” wide rolls, +/- ¾”. CWF Rubber Flooring Inc. honors a five year warranty; the best and most confident warranty in the industry. CWF is to premier rubber flooring store in California and the USA! Rubber floor swatch samples are free, just pay ten dollars for postage. We urge potential customers to acquire samples and compare our rubber flooring with our competitors. Perform your own brutal tests on the rubber swatch to determine durability. 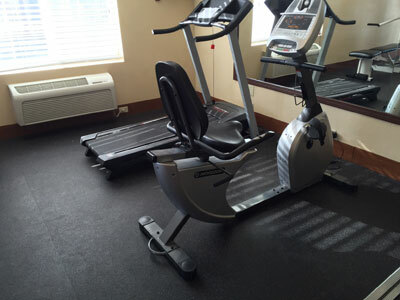 Our sport flooring will meet and exceed your fitness center or any gym flooring systems. or fill out the estimate request form. Our rubber floors are durable enough to endure the dropping of heavy dumbbells in weight rooms up to 250 pounds or handle cargo as pick up truck bed liners. 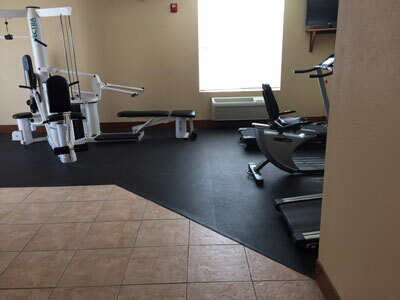 Rubber weight room flooring will, in addition, to protect floors, will assist to muffle the sound of clattering weights, treadmills and other exercise equipment. Even light trucks will not damage or even tarnish the flooring if customers decide to use our rubber flooring as a garage floor. Our sport and aerobic floors are designed to accommodate high impact areas that undergo daily wear and tear. They are durable enough to withstand the harsh environment of weight rooms, where weights and dumb-bells are dropped on a daily basis, or ice skating rinks, where blades are the standard footwear, yet gentle enough for a children’s playroom. 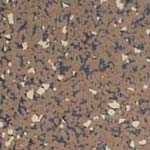 Available in three thickness: 3/8” thick (2.3lbs per sq. ft.); 1/4” thick rubber flooring (1.7lbs per sq. ft.) and 1/2" thick. (3.4 lbs per sq ft). The( half inch thick aerobic rubber flooring being less dense than, weight room floors, weighs approximately 2.7lbs per square foot. We employ state-of-the-art technology to create rubber flooring that is durable, comfortable and fashionable, but most importantly safe and slip-resistant. We carefully calibrate the rubber compression of our flooring to minimize slick surfaces. Companies across the world lose millions of dollars annually, as well as lost production time, from employees who claim to injure themselves on the job. Allow our rubber flooring to safeguard your company against lawsuits which allege hazardous working conditions. Visit us in Palmdale, California, -just an hour north of Los Angeles, California and view rubber floor products, samples and swatches. 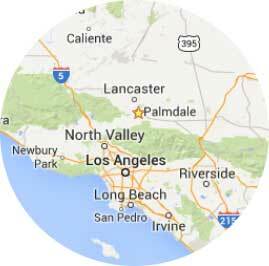 Map to our Los Angeles rubber flooring store. Our Palmdale, California warehouse is only thirty minutes north of Santa Clarita, California or 1-1/2 hours south of Bakersfield, California. Address: 38325 6th Street East, Palmdale, CA 93550 Call before you visit us: 1-661-273-8700 to determine available rubber floor stock. the interlocking tabs into place. 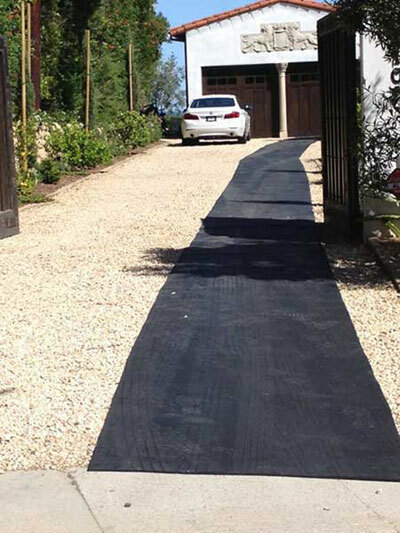 Customer Bobby T. of Santa Barbara, CA provided this photo of five 25 ft. long rubber rolls for his pebbled drive-way. This adds easy access for bicycles, motorcycles, lawn-mowers and other wheeled vehicles. 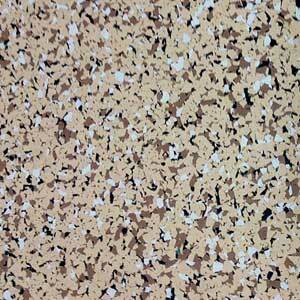 Common color options include 20% color fleck/80% Black. Solid black is the most economical. 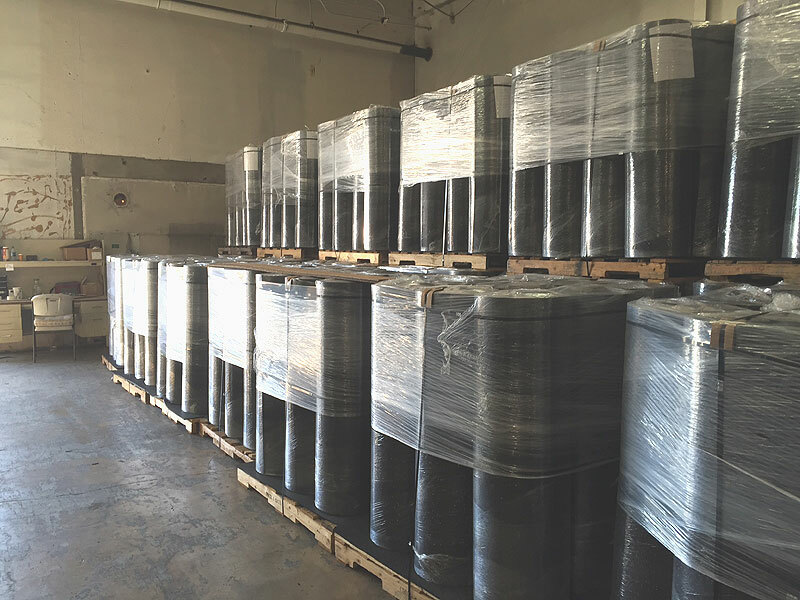 Our stock rubber floor products, minutes from Santa Clarita, California and just one hour north of Los Angeles, consists of solid black rubber rolls, 20 feet long by 4 feet wide. Interlocking rubber tiles are stocked in our North Los Angeles warehouse consists of 2 foot x 2 foot tiles, 8 mm thick, with color options of 90% black, 10% color of blue and gray or 10% beige and brown a favorite for earth tone aficionados. Price per tile: $8.58, 8mm thick, solid black rubber rolls, $1.37 sq ft. , 3/8" $1.82 sq ft.
enough to withstand dropped weights.. The common usage for rubber floors in roll or sheet format is that, of course the floors. Our mom & pop customers also use the rubber for horse stall mats, under treadmills and as a barbells, bench press or dumbbell mat-esp. the 4 x 10 x 1/4"rubber mats-to protect hardwood floors and help reduce sound from the ballistic repetitive sound of the treadmill. Even though, the rubber is non-textured, customer still use the rubber mats as a scraper mat. Another application is for work bench tops, especially if the user uses loud tools, especially hammers. One quarter inch thick is sufficient to protect work counters. Due to the durability of rubber, customers often use the small rubber sheets as a mat for a pick-up truck liners, truck bed or trailer floors, on walls, between door frames to prevent damage from utility & dump carts, pallet jacks and hand-trucks. Quarter inch can be cut to your custom specifications with a utility knife. Any excess rubber sheets can be cut into squares and place under furniture, esp. metal cabinets, to protect hardwood, marble or tile floors. 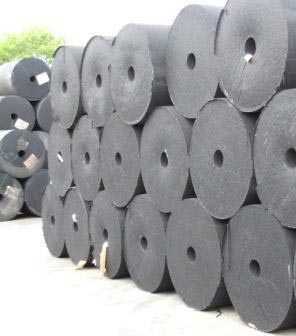 The versatility of rubber flooring rolls is numerous but the main objective is to protect your floor, wall, automobile, etc. and to abate noise levels in weight rooms, fitness centers and between businesses "condos units, etc. Trade Show Booths, Store Fronts, fitness rooms, etc. Colored Rubber Mats: Ideal for treadmill mat, rubber pick-up truck liner or home weight room mats. 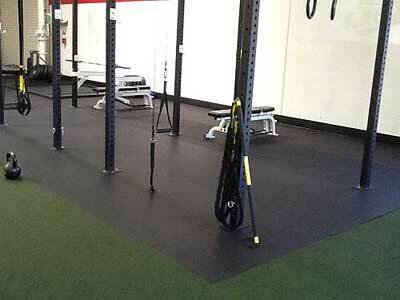 Thick rubber flooring for weight rooms will abate noise and protect floors from weights, dumb bells and treadmills. Photo: Artificial indoor grass turf surrounds a weight room area. 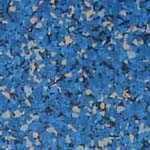 A Complete REFUND will be provided if the rubber floor samples are mailed back to us! 1.Is it necessary to glue the rubber flooring down? 2. I have a home gym. How thick of a floor will I need? For residential purposes, ¼” thick is both an economical and practical solution. It is dense enough to handle light traffic and equipment found in most home gyms. The 3/8” thick provides more sound dampening and floor protection against heavy equipment, so it is recommended for larger machines or heavy weight racks. For rubber sheets, 4' x 10' x 1/4" thick please visit our residential rubber sheets Price: $99. 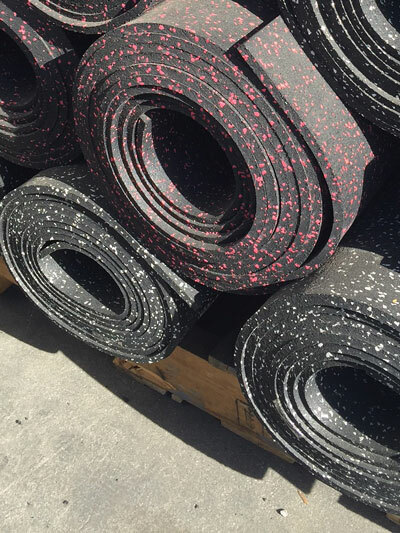 If you would like to drive an hour north of Los Angeles, California we have available a variety of rubber flooring products to view. 3. Which is more economical, the rolls or the tiles? While the interlocking tiles are typically easier to install, especially in a temporary environment or where they would need to be moved or cleaned frequently, the rolls are less expensive and provide fewer seams over the area. This is due to the manufacturing process of the tiles vs. the rolls. Rubber rolls can also be custom cut to the linear foot. The great advantage of the interlocking rubber tiles is that if they are damaged then can be replaced one tile at a time. 4. What are my color options? Can we have custom colors? 5. Do you offer a warranty? 6. How long are the rubber rolls? Can we get custom cuts? The rolls are as long as you need them to be. We provide custom cuts to-the- linear foot between 20-200 linear feet. 7. Which rubber is most appropriate for aerobic activities? 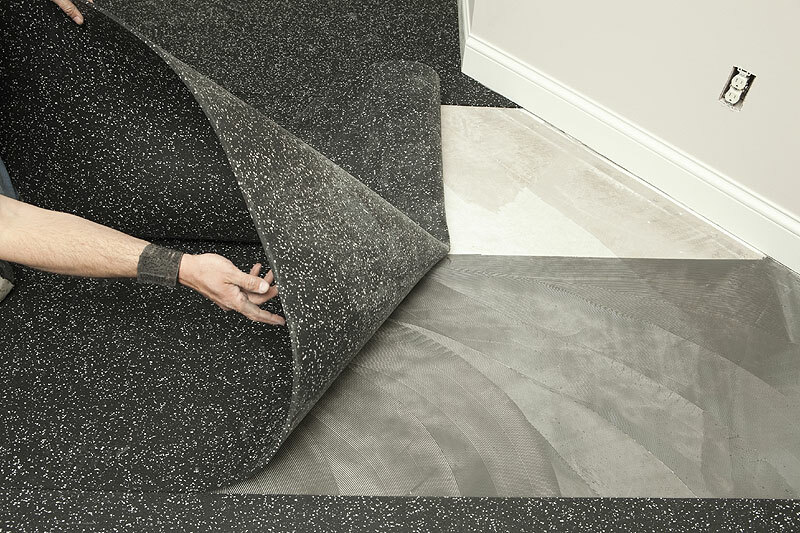 The ½” black aerobic flooring rolls will provide the most comfort of all, as it is less dense and provides more cushion than the hard rubber flooring. This is an extremely durable floor and will out last gym mats or foam puzzle mats. However, only BLACK is available. 8. 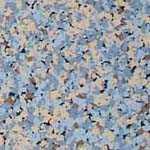 Is rubber flooring suitable for outdoor use? Our hard rubber flooring can be used for outdoor use, but it is not recommended to be glued down outdoors. Our rubber is weather resistant and waterproof. Even when the rubber is wet, it will maintain moderate anti-slip properties, as compared to smooth plastic tiles. If anti-slip properties is the customer's main concern then we suggest the perforated decking tiles. This is another options for your outdoor weather resistant flooring needs. 9. Are your rubber floor approved by Leadership in Energy and Environmental Design (LEED)? Yes, as we mentioned above our rubber flooring products are made of recycled tire rubber AND Material Safety Data Sheet. Proudly made in the USA! 10. I'm undecided to use the cross link rolls or the rubber rolls. Can you advise me, please? Rubber floors are more dense and durable than cross link flooring. The polyethylene cross link rolls will degrade faster over time and due to the softness-if used as flooring-weight room racks will lose its stability and may wobble and create a hazard if it falls. Exercise foam rollers for fitness training & aerobics are also made of polyethylene. 11. I live in Santa Clarita, California. 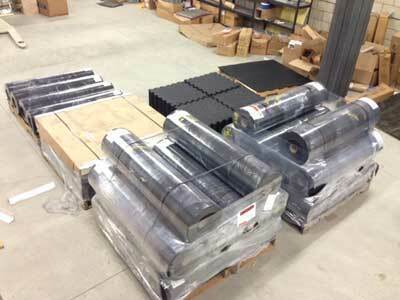 Can you ship the rubber floors to Santa Clarita, CA for free? It's for our garage and measures 20 feet by 20 feet. 12. We have a small area to cover with the solid black rubber rolls. Can we fit 200 sq. ft. in our Toyota Camry to save on shipping? By the way, 200 sq. ft. ¼” thick can fit in the back seat of your Camry. You’ll need two strong people to assist you to unload. We’ll help you load the flooring into your car. For added leverage we suggest placing a strong towel on the back seat, and then place the rubber flooring rolls on the towel so one can pull the roll out by the towel. A 50 ft. x 4 ft. roll measures 4ft. wide x 18” diameter and weighs approximately 340 lbs. 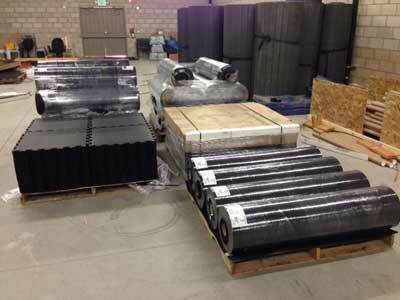 Shipping rubber flooring rolls to San Diego, California cost approximately $150, FYI. 13. We have a Toyota Tacoma pick-up truck and would like to will call the flooring at your store in Palmdale, CA which is 2-1/2” hours from San Diego, CA. How many square feet can I fit in my truck? Check the driver’s side door-jam label for maximum load capacity information. The capacity is approximately 1325 lbs. @ 1.7 lbs. per sq. ft. for the ¼” rolls. A Tacoma can load approximately 780 sq. 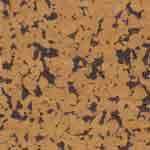 ft. or approximately (240) 2 x 2 x 8mm thick interlocking rubber tiles which equals approximately 800 sq. ft. A Camry has a load capacity of approximately 900 lbs. or approximately 400 sq. ft. of ¼” thick rolls or (73) 2 x 2 x 8mm tiles (244 sq. ft. ) . 14. I just need a small rubber mat for under my bench press. What size do you suggest? The 4 x 10 x 1/4" thick rubber rolls will meet your needs. 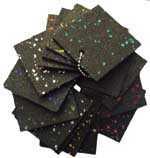 The small home use rubber mats come in solid black or 10% color fleck. 15. We are looking for a sport floor that we can use in aerobics center and weight room. The typical weight room floor is too hard for aerobic training and those foam puzzle mats are too soft for a weight room area. The question is, do you have a floor that can be used for both applications? Yes, we do! 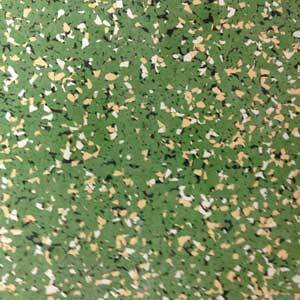 Our 1/2" thick aerobic rubber flooring weighs only 2.3 lbs. per sq. ft. The transitional rubber sport floor for weight rooms, etc. weighs 3.4 lbs. per sq. ft. The point is that the aerobic floor is less dense, consequently provide superior anti-fatigue properties but just dense enough for a light-weight room area. 16. We like the color stone quarry. It's 90% gray with 10% black. It would look great on our concrete deck and would match the stone walls. We want about 350 sq. ft. Does this have to be purchase in 1400 square increments? No, it does not have to be purchased in increments. This also applies to colors wheat fields and grass green. However, minimum order is 120 sq. ft. Keep in mind that using rubber flooring on an out door deck will work just fine. 17. CWF states the rubber sport floors are made of hard rubber? Can we use this for boxing and as a aerobic floor like jump rope and exercises? Yes, however it's a bit firm for these non-weightlifting activities. Perhaps our less dense dance aerobics flooring will suffice. This flooring can be used for weight rooms also. 18. We are undecided whether to purchase the 1/4" or 3/8" thick. We are using this for a home gym with dumbbells, bench press and a tread mill. Which thickness is recommended? The 3/8" will last longer and reduce the noise associated with weight training and provide better anti-fatigue properties. If your on a serious budget then the 1/4" will suffice. An average 20ft. x 20ft. (400 sq. ft.) two car garage would cost approximately $548 for the 1/4" , 3/8" $728, only a $180 difference. 19. My family and I own an apartment building in San Francisco, California that caters to senior citizens. The kitchen is communal. The kitchen floors get slippery after each use and create a slipping hazard. The question is; can we use the rubber flooring rolls for a kitchen? Yes, however the daily spilling of oil and grease will still create a slipping hazard. Water spillage on the rubber floors or mats will have a more secure footing than water spilled on vinyl tiles, laminate wood floors or concrete. The other issue is that of design and color; solid black rubber is the least expensive. If you desire a kitchen floor with less black and a high percentage of color, then it can be expensive. 20. The undersigned is a department Chair at a community college in Dallas, Texas. We would like to use the rubber rolls for a bulletin board. Can we use the rubber for bulletin boards? Absolutely yes! We produce a less dense black rubber that can be used as a bulletin board. The advantage over cork –Vs- rubber bulletin boards is that thumbtacks stick into the rubber bulletin board more securely / less likely to fall out. From an aesthetic point of view, if a solid black rubber bulletin board will meet your school or business design requirements, then a rubber bulletin board is an appropriate option. 21. My husband and I purchased an outdoor playground set with a swing, monkey bars, slides and a mini-gymnastic ring set, etc. for our kids. I am concerned my kids will fall and get hurt. Will your ½” thick rubber mats help prevent injury? No. No such rubber surface can prevent injury. Our rubber sport surface is not recommended for a play ground surface. There’s strict fall rating for playground surfaces. 22. We run a fitness center and need to upgrade the weight room flooring with something with a little more color than just black. Any suggestions? 23. Can you recommend a private girls gym in the Los Angeles area? 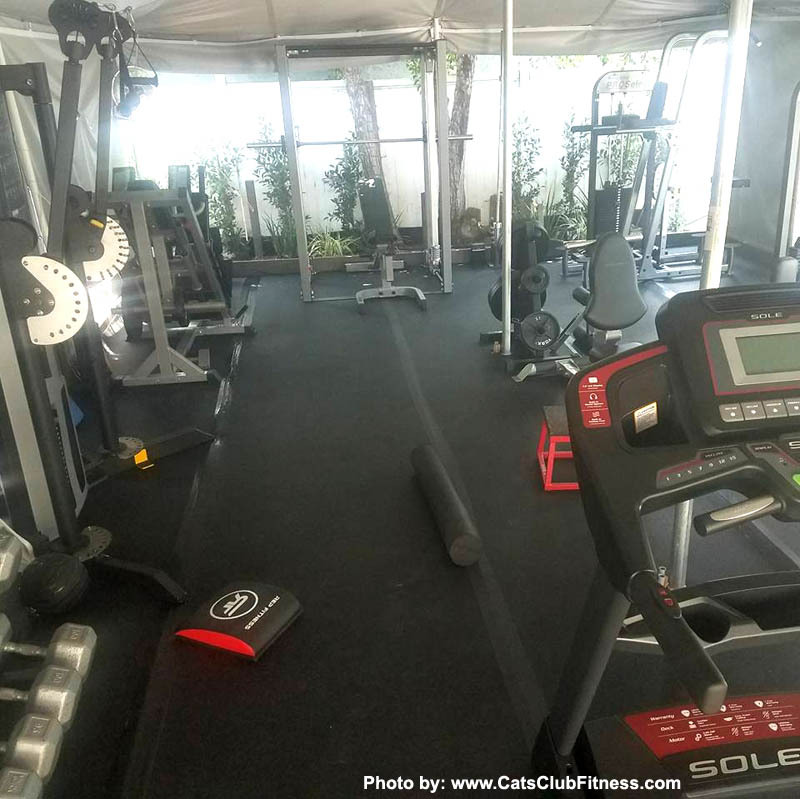 There's a intimate community gym called Cats Club Fitness in Sherman Oaks, CA which provide clients personalized fitness training for all levels. 24. We live in Lexington, SC and are looking for a humble local gym for men and woman that also has yoga classes. The Flex Body gym in Lexington, SC has a quality fitness and yoga program. 25. Our school needs a rubber instant runway for track and field. Can we use the weight room flooring for this application? We recommend the 1/2" thick instant runway for track and field This rubber roll is less dense and will provide superior anti-fatigue properties. 26. Do you have maintenance instructions on the weight room flooring? How to Cleaning Rubber Floors (PDF) This is not laborious nor do you need to hire a professional.